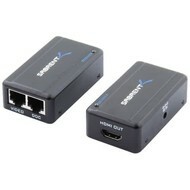 Sabrent HDMI-EXTC HDMI Powered Extension Extender Cable Over Cat5e RJ45 Extender Adapter - HDMI-EXTC with Power Supply - NWCA Inc. This HDMI Extension adapter allows you to connect your HDMI devices to a distance of up to 200ft with the help of a Cat5/Cat5e/Cat6 patch cable (not included). No need to move your Displays around! One pair as a full functional module, no setting.